Auchroisk 1996 Single Malt Whisky is from Gordon & MacPhail's Connoisseurs' Choice selection and was distilled in 1996. It was matured in refill American hogsheads and bottled in 2014. 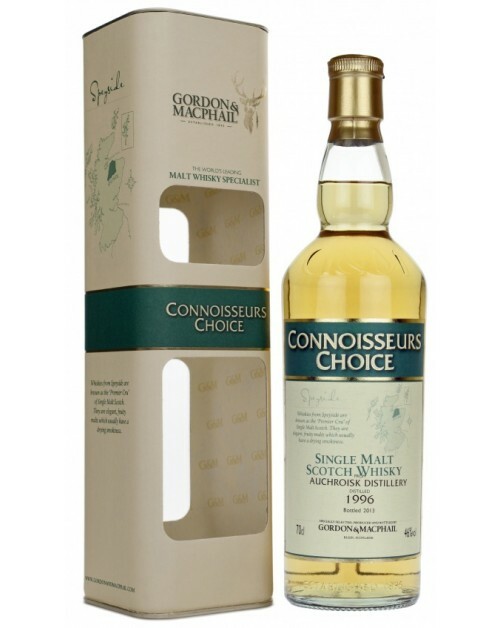 The Connoisseurs' Choice is a respected and varied range of terrific, independently bottled whiskies. This is a great dram. Nose: Fresh and fruity with ripe plum and kiwi aromas. Toasted malt and subtle herbal notes with hints of old leather and aniseed. Palate: The palate is peppery initially with stewed plums and lemon flavours. A lingering milk chocolate edge develops.